Jump to the next scheduled event. Carl Edward Nittinger, age 71, of Salem NJ (formerly of Haddonfield) passed away on January 17, 2018, at Penn Hospice in Philadelphia PA. He is survived by his sisters, Virginia Merkel of Media PA and Louise Stotz of Palm Coast FL. Carl graduated from Haddonfield Memorial High School in 1964 and received a B.A. in Church Music from the Peabody Institute at Johns Hopkins University in 1968. He studied Choir Training and Organ Accompaniment at the college of St. Nicolas in the Royal School of Church Music (Addington Palace, Croydon England), graduating in 1971. Carl received a Master of Science in Historic Preservation from the University of Pennsylvania in 1991. Carl was a long-time member of the Athenaeum of Philadelphia, the Orpheus Club of Philadelphia, and the National Washington-Rochambeau Revolutionary Route Association (W3R)-US -- serving as treasurer of the latter for several terms. He worked for the State of New Jersey Historic Preservation Office and was an organist for several churches starting at Grace Church in Haddonfield at age 9. Carl's many interest included furniture restoration, music, horses, sailing, and walking. His interest in historic preservation carried through his life with the purchase of the historic house of the Goodwin sisters, Elizabeth and Abigail, in Salem, New Jersey. This home is included in the National Park Service’s Network to Freedom. The home was featured on many house tours in Salem. Carl does not appear in many W3R®-US photos over the last decade, but he was a conscientious Director and Treasurer of the W3R®-US, and he participated actively in most of the Board meetings while he was a Director. Carl put his heart into promoting and developing the trail, and his memory will live in our hearts as we continue that good work. 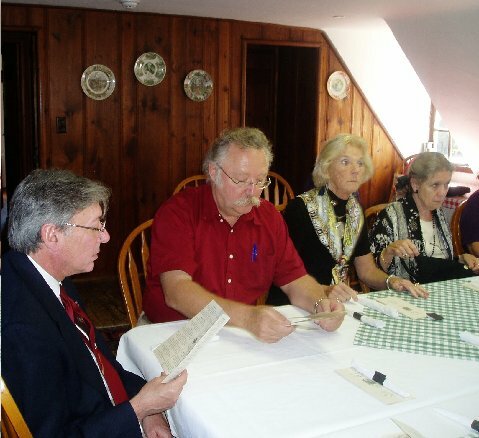 and Veronica Eid (DE) at lunch in Yorktown VA in November 2007.
as a National Historic Trail. The Pennsylvania Society SAR commissioned and procured from sculptor Pierre Lefebvre a bronze bust of the Comte de Rochambeau, c.1781. 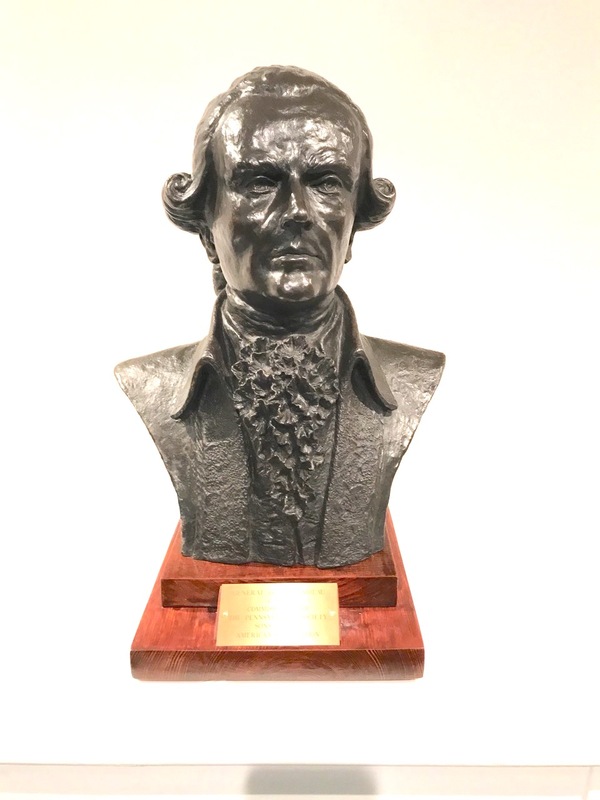 On April 18, 2018, the PASSAR gifted the bust to the Fine Arts Department at Lafayette College (LC) in Easton PA. The college holds a major collection of fine art and artifacts from the life of the Marquis de Lafayette and from French participation in the American Revolution. The bust will be a major item in a new public exhibition at the college. The photo below shows the bust upon delivery to the college. From left to right are LC Artifacts Curator Diane Shaw, LC Curator Michiko Okaya, French faculty member Olga Anna Duhl, the bust, SAR member Lanny Patten, sculptor Pierre Lefebvre, and SAR member Don Drewry. The Fourteenth Annual Membership Meeting of the W3R®-US included a tour of the Courthouse in New Castle and the Annual Meeting. 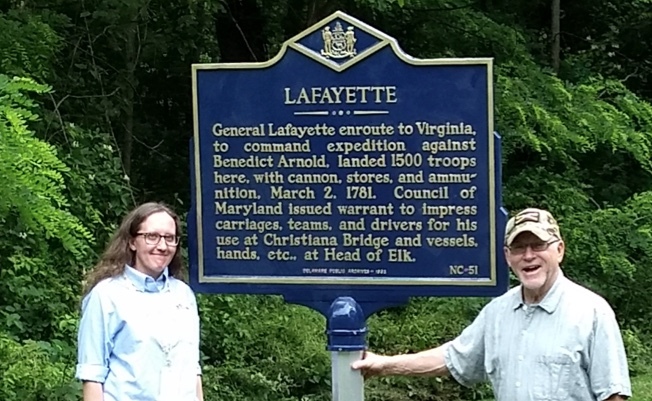 A new interpretive sign on Lafayette was installed in Leuden Green Park thanks to Katie Hall of Delaware Archives. This was a project of the W3R®-Delaware. The original sign disappeared in the 1940s. The official sign dedication will be held after the arrival of the U.S. flag that currently flies over Lafayette's grave in Paris. See November 4 listing below. At 3:30 PM a W3R® interpretive and way-finding marker was dedicated on the Eastport Bridge south side landing along 6th Street. Brian Callahan represented Annapolis Mayor Gavin Buckley. The signage was organized by the American Friends of Lafayette and the W3R®-US. The Next Scheduled Event should be just below this block. Click this line for notes on past events this year. 2018-09-13 (Thursday) to 2018-12-06 (Thursday) Between September 13 and December 6 Dr. Robert A. Selig will speak at many sites along the trail. Some talks are about "Skulls and Skeletons: Military Burial Practices and Battlefield Clean-Up along the Washington-Rochambeau National Historic Trail" and some are about "The Washington-Rochambeau National Historic Trail in the state of ___". See W3R-US website event calendar for details. October 18 (Thursday) - The Fall Board meeting of the W3R®-US will be held in Yorktown VA at 1:00 PM in the American Revolution Museum at Yorktown, 200 Water St. Route 1020, Yorktown, VA 23690. 1:00 PM at the Pencader Heritage Museum, 2029 Sunset Lake Road, Newark DE. Dedication of an interpretive marker for Germans in the American Revolution. 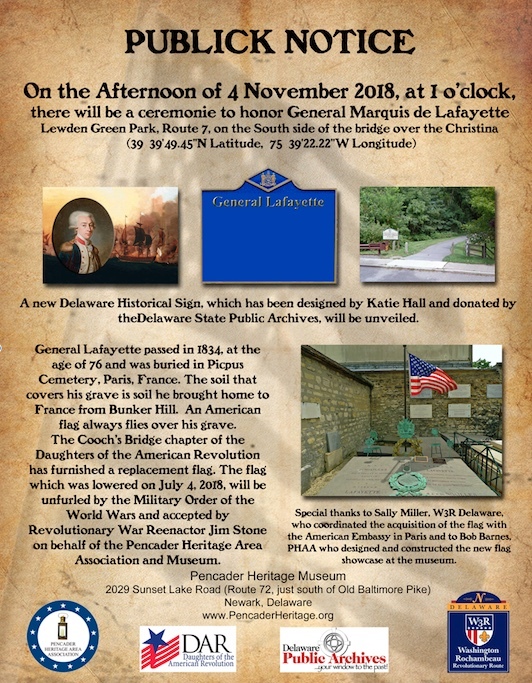 Dedication of the Lafayette sign in Leuden Green Park and display of the U.S. flag which flew during June of 2018 over Lafayette's grave in Picpus Cemetery in Paris, France. After this ceremony the Pencader Heritage Association will house the flag permanently in their nearby museum.